Helen Hurst when she wrote this in 1988 was training to become a history teacher. 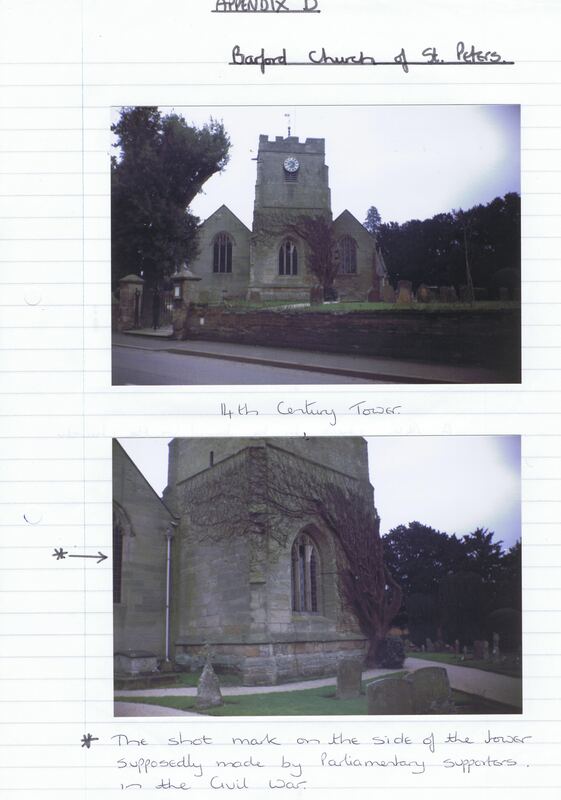 This is one of her assignments and provides a pocket history of Barford from earliest times. 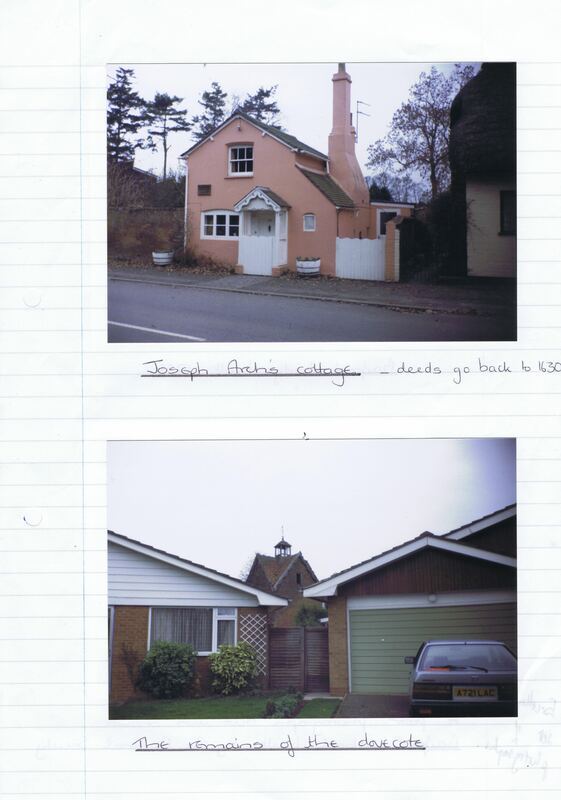 She provides a selection of photographs of different period housing. These are referenced in Appendices and appear below this post. Identify the major historical features of the landscape in a selected area and show how you might utilize them to teach history to children of a given age range in a primary school. After reading Parker’s book, “The Common Stream”, I have to admit to being influenced by his idea of a stream witnessing changes to an area over the centuries. Barford, a small Warwickshire village, three miles from the town of Warwick, has the river Avon running by it and undoubtedly as Barford has grown from settlement to village this river will have seen many changes. Even if there was not any settlement of people in Barford at this time there could well have been people passing through the area gathering at these important religious sites. A farming settlement, typical of the Iron Age, has also been excavated at Wasperton and a bronze chisel has been found at Barford and is on display in the museum. 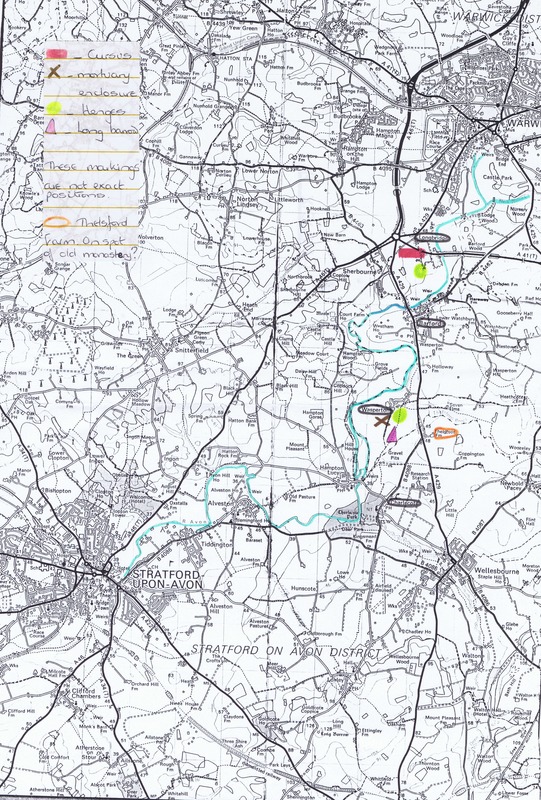 The Romans did not settle very close to Warwick and it appears that Barfords’ “earliest community consisted of the early Saxons who, after venturing along the river _ _ _discovered the shallow crossing which is still near today’s bridge” (Twigger p7). The Anglo-Saxons first entered Warwickshire through the river valleys and Barford was likely to have been settled by the group known as the Hwicce. Warwickshire would still have been predominantly forest and as the Romans had not settled close to this area roads would probably have been unknown. This would have made a safe crossing of the river of vital importance. This is confirmed in the volume for Warwickshire by the English Place Name Society, which lists “Bereforde” as the earliest known spelling and gives as the probable meaning a ford which can carry a load of corn. Bereforde is from the Domesday Book and although over the centuries the spelling of the name has changed form “Berford” to “Bereford” to “Bearfoote”, as revealed by contemporary documents, the meaning has remained the same. “Berefoote” is on Sheldon’s tapestry map of Warwickshire, made in the 1670’s. The entry lists a priest so presumably there was a church and there was also a mill. Corn mills have been a feature of Barford until the present day but this is no longer the case as the mill was demolished in December 1988. The Domesday entry also allows for a rough population count and with two knights, one priest, four villeins, eleven bordars and four slaves mentioned it is possible to multiply this number by the estimated household size, thought to be five, and suggest that Barford possibly had a population of about 110 people. 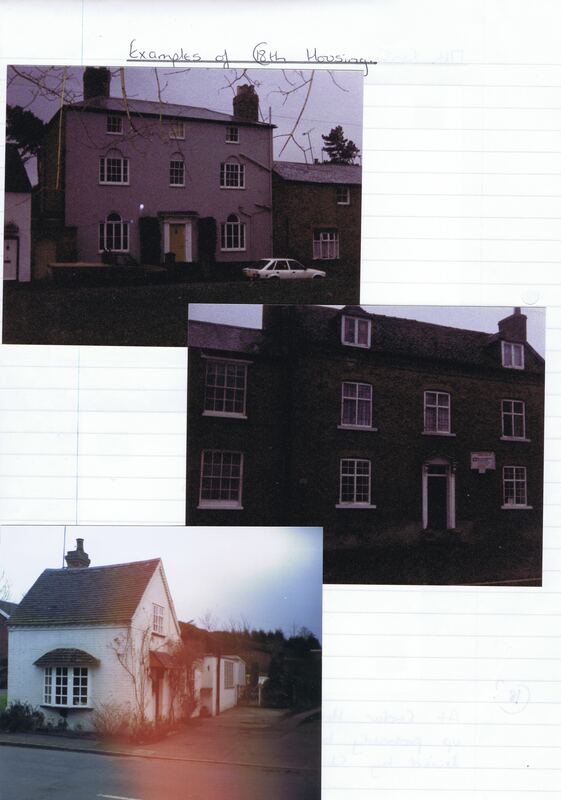 Over the centuries the ‘principal inhabitant came to be known as the sqire, examples being the Warde family who lived at Barford Hall opposite the church” (Twigger). The Hall is no longer there but traces of the original stone walling are still visible. Another feature of Barfords’ landscape is a dovecote dating from the eighteenth century, which Twigger has argued was a special right of the lord or squire. He was able to own a dovecote “whose birds foraging freely on other’ land, provided the fresh meat” for the lords’ table. 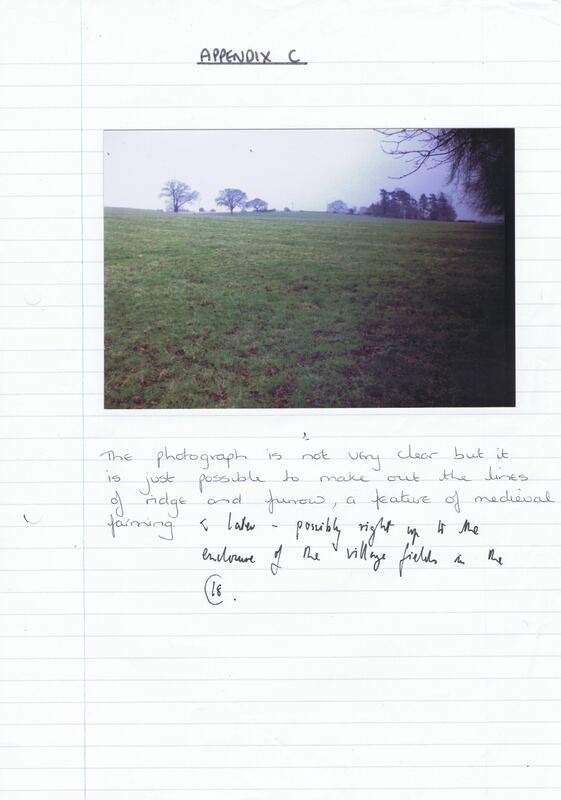 There are still traces of ridge and furrow, a feature of medieval farming, to be found in two fields in Barford, (Appendix C). Today, farming is still a feature of Barford but employs few men. 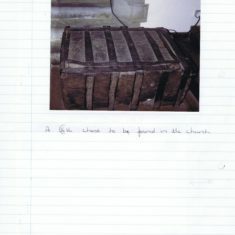 John Rous, an historian and chantry priest, based at Warwick, writing in the fifteenth century about the effects of medieval enclosures said, ‘the Barford neighbourhood includes “Lee Iuxta Berford” which has disappeared” (County History vol2) suggesting that the village is probably a shrunken one. 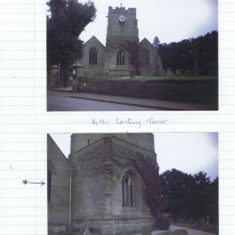 “The Saxon church was rebuilt at the beginning of the thirteenth century” (Twigger p15) and “Henry de Bereford and Isabel his wife, sometime between the years 1200 and 1212 granted the church of Barford and property in the parish to the canons of St Radegunde of Theulisford” (County History vol.2). 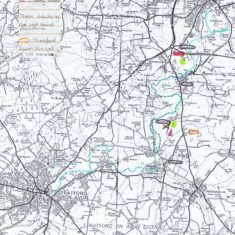 The Trinitarian Friars of Thelsford founded a small monastery near to Charlecote and on the map of Barford (Appendix A) Thelsford Farm can be seen. Pevsner dates the tower of Barford church as late fourteenth century and the rest was rebuilt in 1844. There is an interesting feature on the tower in that it has shot marks on the sides of it that are said to have been made by parliamentary supporters marching towards Kineton before the battle of Edgehill in 1642. The story is that a member of the Warde family hoisted the Royal Standard on the flagpole and the Roundheads tried to shoot it down. (Appendix D). 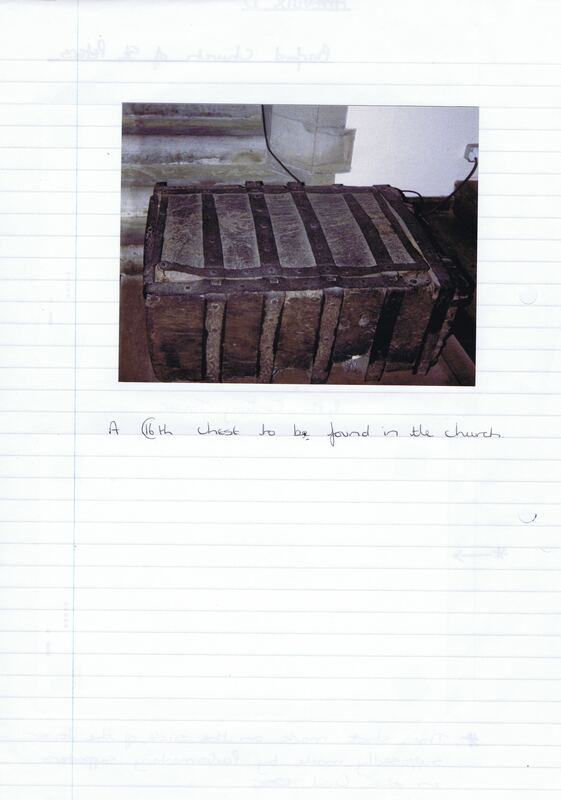 Inside the church is a sixteenth century chest which could have been the poor box for the area and there is also a fourteenth century stone effigy of a woman. The list of incumbents starts at the year 1281 but as there was a priest at the time of Domesday it is reasonable to assume that the church continued to thrive. Two Methodist chapels of the early nineteenth century are also a remaining feature in Barford although they are now private houses. “Under an act of 1760 the whole parish was inclosed” (County History vol5) and there is an enclosure map in the County Record Office that can be seen. 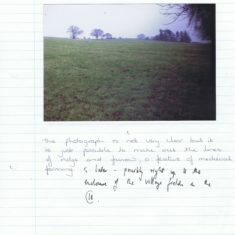 “Every field was given a name which identified the piece, having a certain characteristic of usage” (Twigger p13) and today fields are still known as “Slaughters Hill”, “Brickiln Close”, “Marlpits”, “Archers’ Furlong” “Newland Piece”, “Brook Meadow”, “Apple Trees”, “The Elms”, “Collins Corner” and “Meadow Flat”, to mention a few. The church allotments, still in use today, date from 1760 when they were given to the churchwardens in lieu of pieces of land that had been enclosed. The naming of “Slaughters Hill” intrigues me because Barford did have a licence to operate gallows in Edward I’s time although I suppose the slaughtering of animals would be more likely. One explanation given is that it derives from “Sloe tree”. 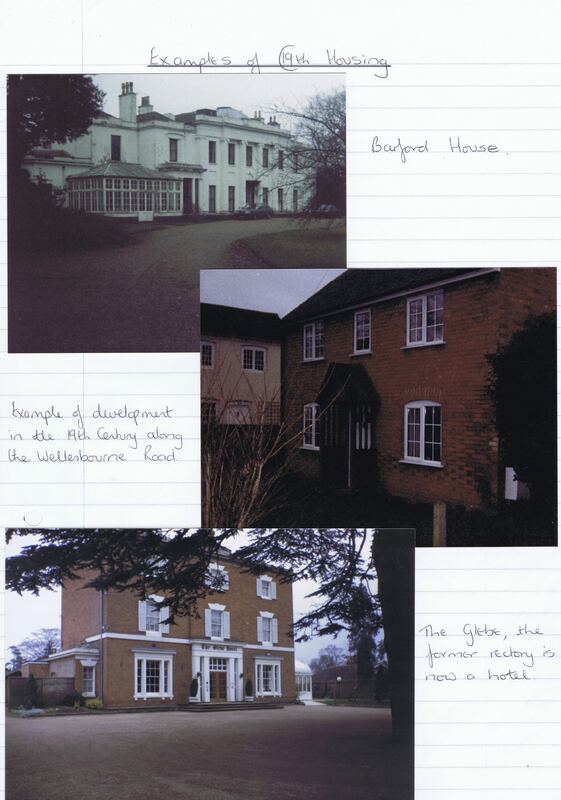 The only large house remaining in Barford now is “Barford House”. Today it is looking quite dilapidated but it must have been impressive when first built. It is a regency style house of the nineteenth century. 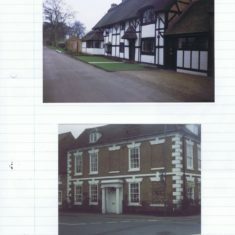 No older manor houses remain although roads have been named in Barford after old families such as Fairfax Close, Dugard Place and Verdon Place. There are a number of houses in Barford that I found difficult to date especially with today’s trend of “gentrifying” village properties. However, “some 15 or 16 of the houses show remains of seventeenth century timber-framing, a few having thatched roofs” (County History vol 5), and the position of these houses points to Barford being a long street village (Appendix E). 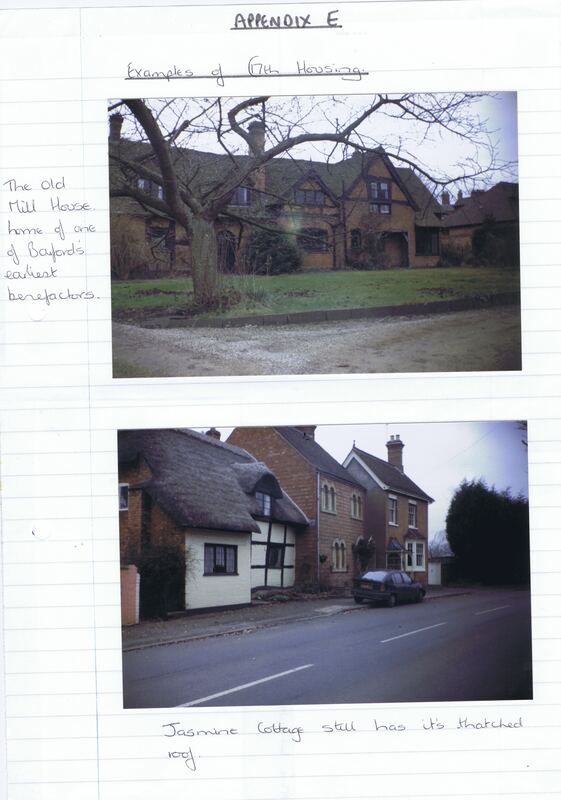 According to the Hearth Tax returns for Barford “the proportion of houses with three or more hearths was unusually large” (Twigger p24), and in a way this is echoed today with Barford attracting people who can afford to maintain and develop these older properties. Another feature of the landscape is the school. It was built in 1851 by the National Society and was, and still is, a church school. 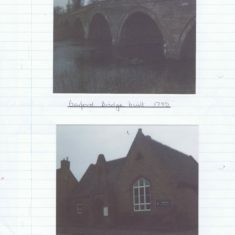 Before the school was built Barford had its share of benefactors who provided education of a sort to some of the children in the area. Thomas Dugard, whose gravestone is in the sanctuary of the church, was a headmaster of Warwick School before taking the living at Barford in 1647. “In his will of 1677 he provided four pounds for teaching 14 children of poor neighbours to read and one pound for teaching two poor girls to sew” (County History vol 2). John Beale, the miller, was one of Barfords’ earliest benefactors who contributed to the maintenance of a free school. 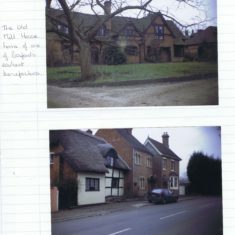 “The Old Mill House” is still a feature in Barford. The present bridge, over the river Avon, was built in 1795 but there were bridges before this. “The Rev. I Smith died at Sherbourne in 1612 leaving some money for the repair of Barford bridge “old ruins” and “Warwick Quarter Sessions Order states that the bridge at Barford was broken down for security of the county “During the civil war” and later repaired” (Twigger p26). 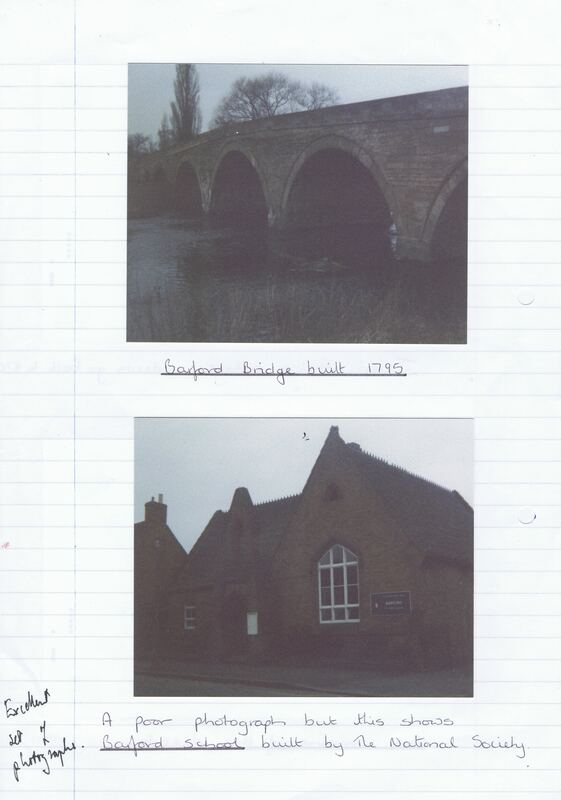 Dugdale mentions the bridge over the Avon in his “Antiquities” for Warwickshire. A famous resident of Barford was Joseph Arch, the founder of the Agricultural Workers Trade Union and eventual Member of Parliament. 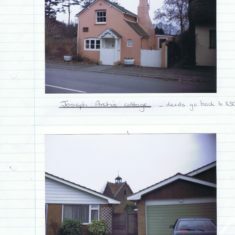 The house he was born in is still standing in the village and the deeds of the cottage go back to 1630. His gravestone can also be found in the churchyard. 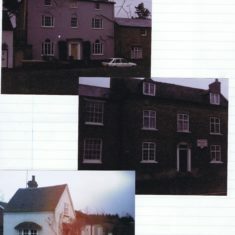 There used to be two forges in Barford, one by the river and the other on High Street, which were the two principal streets in the development of the village. The forge in High Street closed in 1978 and has now been converted into a private house. 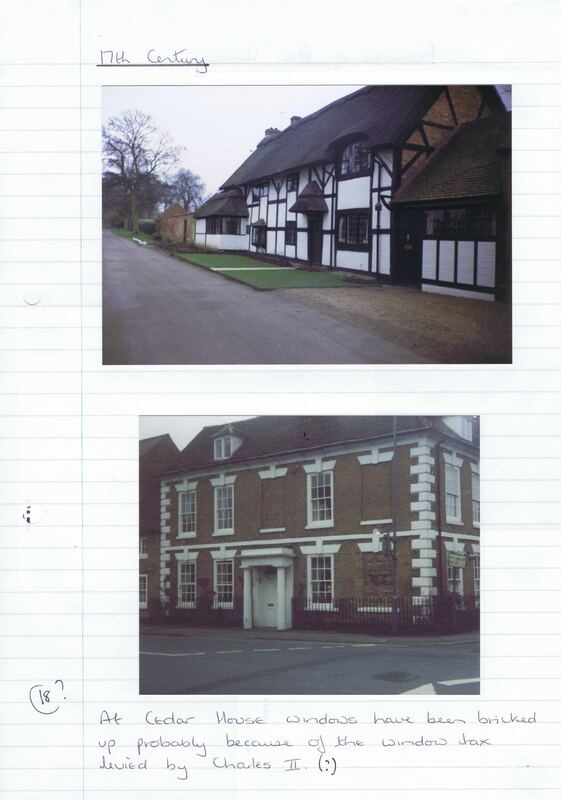 Kelly’s Directories lists tradesmen and inhabitant of Barford and a look at these records show some of the social changes that have taken place in the area in the nineteenth and twentieth centuries. Carriers used to be a feature as did a gas works and numerous trades were carried out. The markets at Stratford and Warwick would probably have ben important in this and these markets have probably been of economic importance to Barford for many centuries. The present village hall was given to Barford by Mrs L. Smith-Ryland in 1931 in memory of her husband. 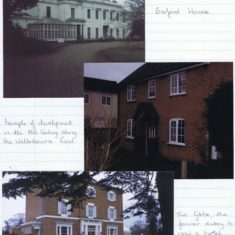 The Smith-Ryland family still has power in the village, he is the Lord Lieutenant for Warwickshire, but this power has diminished over recent years as land and estate houses that belonged to them have been sold. Today Barford is basically a commuter village. Few people who live in the village work in the village and I suppose the community is held together by the church fetes and various leisure societies that are a feature of the twentieth century. There is no doubt that the River Avon has witnessed many changes as Barford has developed over the centuries and with the building of the M40 close to the village and an application to site a gravel works in the village, the Avon will continue to witness changes in the features and life of Barford over the next centuries. “A History Of The County Of Warwick” Vols 1, 2, and 5. This page was added on 04/02/2018.